If you are just starting to learn how to sew, you may find yourself stumped by the new, confusing words used frequently in sewing tutorials. Even if you've been sewing for years, you may come across unfamiliar sewing terms now and then. Don't let strange sewing vocabulary keep you from creating adorable and fun sewing projects. Our Glossary of Sewing Terms will give you an understanding of every word you need to know to become an expert sewist. From stitches to tools to fabrics, we have it all. The next time you start a new project, make sure to consult our guide for all of your sewing needs. This free list of sewing terms is an excellent resource for any and all sewists. Just like every writer needs their dictionary, every sewist needs their list of sewing terms close by. We have compiled this list so you do not have to! Print all of these sewing terms out or save paper and bookmark our extensive list of sewing terms to refer back to the next time you are absolutely befuddled by a word. Brand new to sewing? Check out our sewing for beginners free eBooks! Applique: An embellishment that is sewn or ironed onto another piece of fabric. Arm scythe: Armhole where the sleeve is sewn. Awl: Tool used to make holes for an eyelet fabric. Backstitch: Stitch that doubles back on the last stitch that acts to secure seams and mend garments. Batting: Flattened material, usually cotton or fiberfill, that is usually used as the “fluff” inside quilts or garments. Bias: The direction diagonal from the direction of the fabric. The stretchiest part of the fabric. Bias tape: Strips of fabric cut on the bias, often used for binding and facing. 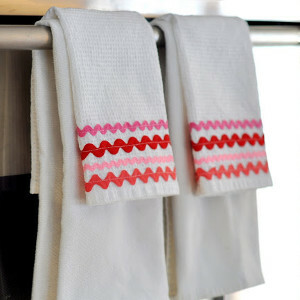 It sews neatly around curve and is used commonly in blankets, placemats, bibs, and aprons. Binding: A strip of fabric used to cover a seam edge or enclose raw edges. Binding creates a neat finish and a decorative touch. Blanket stitch: A hand stitching technique used for decorative edging and embroidery. Blend: Fabric made of more than one type of fabric. Blind hem: Stitch that is not meant to be seen from the right side of the fabric. Usually done by picking up just a few threads of fabric rather than going all the way through. Block: The individual unit of a quilt. Bobbin: The spindle or cylinder on which thread is wound in a sewing machine. Bodice: The part of the garment from shoulder to waist. Bodkin: Tool used for inserting elastic or cording through a casing. Bolt: An amount of fabric on a roll or cardboard piece. Bonding: Joining two pieces of fabric together with a bonding agent or a fabric glue. Broadcloth: Fabric made from cotton or a blend that is tightly woven and may have slight ridges. Buttonhole: A cut in the fabric that is bound with stitching and is just big enough for a button to pass through. Capped sleeves: A short sleeve that doesn't extend beyond your underarm. Casing: Fabric enevelopes used to encase elastic, drawstrings, etc. in garments. Count: Number of warp/weft intersections per inch. The higher the number, the higher the weave. Cording: A twisted or woven “rope” that is used in piping or as a drawstring. When covered in fabric, it is called piping. Cut length: Measurement of fabric that allows for hems, pleats, etc. ; the length to which the fabric must be cut before beginning to sew. Darn: Repairing a hole by stitching back and forth to fill the hole. Edgestitch: A stitch done a scant 1/8 inch from the folded or seamed edge. Embellishment: Adding special stitches, appliques, or other decorations added to sewing projects. Embroidery: A decorative topstitching; embellishment of a fabric which creates a design. Empire waist: A waistline on a garment that is higher than the natural waist. Fat quarter: ¼ of a yard of fabric that is 18 in X 22 in, as opposed to the regular ¼ yard that is 9 in X 45 in. Feed Dog: The “teeth” of the sewing machine that move the fabric as it is sewn. Finishing a seam: Preventing a seam from unraveling and adding stability by using certain stitches or tools. Foot: The part of a sewing machine the presses down on the fabric as it is moved. Free motion: Machine sewing done with the feed dogs down, moving the fabric freehand. Give: Elasticity or stretch of fabric. Grain: The direction of the fabric that runs parallel to the selvedge. Guild: A group of people who discuss and practice sewing. Hem: Finished bottom edge of a garments. Hemline: Lowest edge of a garment once the hem is sewn. Hook & eye closure: A closure with a small hook on one side and a loop on the other. Inseam: Vertical seams on pants between the legs. Interfacing: Sewn-in or fusible fabric used to stabilize the fabric. Lettuce hem: A serged edge that is stretched as it is sewn, resulting in a ruffled edge. Lining: Fabric that covers the construction details on the inside of the garments. Miter: Slanted seams where two hems meet at a corner. Muslin: An inexpensive fabric used to make crafts, back quilts, or make a draft garment. Nonwoven: Fabric that is not made from thread or yarn. Notion: A term for any item used for sewing other than fabric and the machine. Overcast/overstitching: Stitching over a seam to prevent unraveling. Pattern weights: Weights used to hold down paper patterns instead of pins. 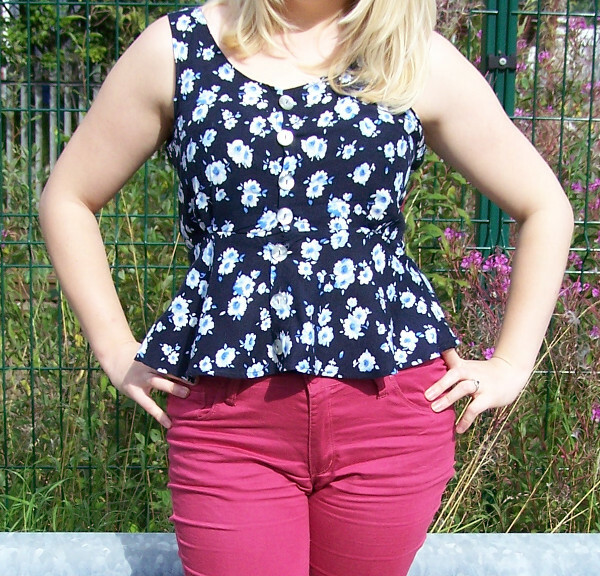 Peplum: A top that has a flared "skirt" waistline. Piping: A slim piece of bias-cut fabric that covers cording and is inserted into a seam. Used as a decorative trim. Pins: Pins hold fabric together. Pleat: A fold in the fabric that is not sewn except on the top edge, providing decorative fullness. Prewashing: Washing fabric before using it in sewing projects to prevent shrinking. Press: Using an iron to smooth fabric. Raveling: Giving the edge of the fabric a fringed look by allowing threads to loosen on their own or pulling threads from a tight seam. Raw Edge: unfinished, cut edge of fabric. Rick Rack: zigzag trim that is used to decorate sewing projects. Rotary cutter: A sewing tool used to cut fabric. It consists of a round blade that cuts through the fabric by rotating as it is rolled along. Running stitch: Simple stitch made by running back and forth through the fabric. Scrap buster: A sewing projects that can be made using your leftover fabric scraps. Seam: When two pieces of fabric are sewn together along a line. Seam allowance: The fabric between the edge and the stitches. Seam ripper: Tool with a small hook that can undo a stitch without damaging fabric. Selvedge: The edge of the fabric which does not fray; should not be included in your cut of fabric. Serger: A type of sewing machine that stitches a seam, encases the seam with thread, and cuts off excess fabric at the same time. They are great for finishing any seams, especially with knit fabrics. Set-in Sleeve: A sleeve that is attached separately to the armhole of a garment, rather than as part of the original cut of fabric. Spool: The holder of thread. Straight Stitch: Stitching made with single stitches in a straight line. Tack: A temporary stitch used to hold pieces together, removed after the final stitching. Tension: Pressure placed on your needle and bobbin thread by your machine. Top stitch: A row of continuous stitches on the top or “right” side of a garment as a sometimes decorative, sometimes functional feature. Tracing paper: Paper used with a tracing wheel that has an ink substance on one side that marks on fabric. Tracing wheel: A device that transfers marks and measurments onto the fabric. Trim: Embellishments such as rick rack, lace, and cording generally used on the edges of a garment. Underlining: Lining that adds body to an article of clothing. Understitching: Keeps a facing or lining from rolling onto the right side of a fabric. Walking foot: Foot attachment that allows a machine to sew through several layers of fabric. Warp: Threads running the length of a given fabric. Weft: Threads running at a 90 degree angle from the length of the fabric. Whipstitch: A simple running stitch used to hold two pieces of fabric together. Wrong side: The side of fabric with no design that usually is not visible when the garment or other project is finished. Zigzag stitch: A stitch that goes one way and then the other, which provides a finishing seam or a decorative touch to any garment. What sewing terms are we missing? Let us know! A good list of terms for a beginner who may not understand the main sewing terms as it avoids having to look them up individually on google. I have copied and pasted this list into word so I could print it out for my 9 year old daughter who is constantly asking me what terms mean when she is working on a pattern and cutting out templates. This list was a refresher for me as a experienced seamstress. I like the format and the diagrams also show a sample of what the terms means. There are more terms that could be added but from the alphabetized listing here, the terms are what's needed for a beginner sewer or experienced. This is a listing that could be printed and used for future references.